Eleven years after his debut album previously released on CDr by Facthedral’s Hall, Deadrow77 is back with his new one, «Dark Waves 4 Little Greys». 29 instrumental tracks (electro, ambient, dark, cosmic, medieval, ethnic, indus, electronica, psychedelic…) recorded 2013-2014. Chronological collection of spontaneous improvisations completely played on a MiniLab 25 (Arturia). The majority of tracks are recorded in a single take. One second touch & tint follows itself then, according to the agent mixer who gets back the sessions, for the most intuitive possible sound fiddling. Narcissist’s strange & curious anthology of uncontrolable, compulsive & convulsive needs, to try to congeal under a desinhibited clumsiness the risky interpretation of the present moment, in the fault the atmospheres, the emotions & feelings of the moment. They are photos, snapshots, Polaroids seized in the air, & stolen from their seizure. Scenographic, not festive & not dance music, to listen to the night or in the dark, rather with headphones & blindly. CD1 recorded in 2013, CD2 in 2014. Mixed by Le K.. Double CD is packaged in luxurious 3 panels digisleeve. This is the first manufactured CD edited by F.H. 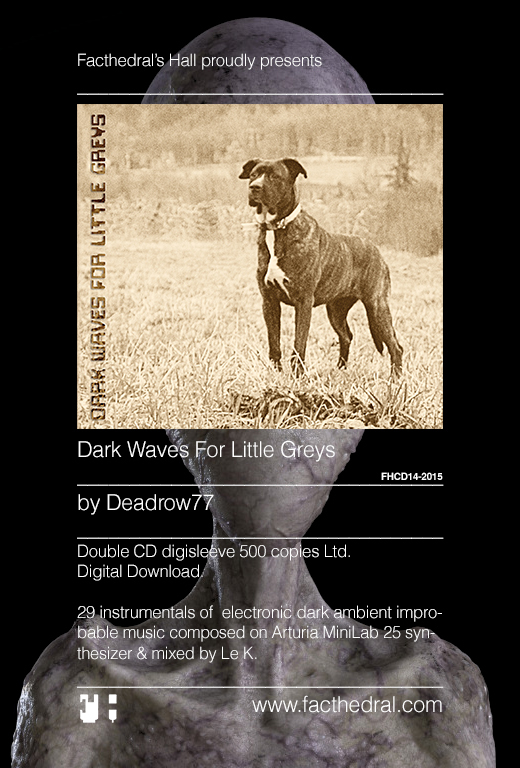 Deadrow77 "Dark Waves For Little Greys"
This second Deadrow77’s album is the very first manufactured CD edited by Facthedral’s Hall, 18 years after the label’s creation, edition & promotion of improbable music. *: a sample of certified bio saffron growned in the pyrenean mountains by Deadrow77.